Opportunity Zones (OZs) are a new investment tool created by the 2017 Tax Cuts and Jobs Act to stimulate investment and economic development in low-income communities. They do this by offering investors capital gains tax benefits in exchange for making investments in Opportunity Zones that can spur business and economic growth. The Davis Opportunity Zone is Census Tract 106.02 (see map). The census tract is a little less than a square mile in size (0.8 sq. mi.) including the area between the north/south UPRR line on the west, L St. and Pole Line Rd. on the east, Covell Blvd. and 8th Street on the north and I-80 to the south, including the Nishi property. This new Opportunity Zone may be of interest to those within the zone interested in soliciting funding from a new incentivized, targeted source of investors; or those considering investing in new business ventures, property or new or expanding businesses needing funding support. The City values receiving this Opportunity Zone designation and targeted investments that may provide benefit to the community. 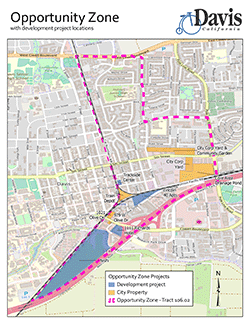 The City’s role is to share information about the Davis Opportunity Zone and does not have specific interests at stake or a controlling role. Investments are not administered or overseen by the City of Davis. Pursuit of investments are the responsibility of the property or business owners. The key benefits of an Opportunity Zone designation are businesses and projects in the zone are eligible for investments from a new source of funding called Qualified Opportunity Funds, and investors are eligible for new tax benefits in exchange for investing in such funds. Investments made by individuals through Qualified Opportunity Funds in designated Opportunity Zones would be allowed to defer or eliminate Federal taxes on capital gains. Investors can get the tax benefits, even if they don’t live, work or have a business in an Opportunity Zone. To qualify for tax deferrals investors must invest the amount of the capital gain to be deferred in Qualified Opportunity Funds that are required to invest 90% of their funds in Opportunity Zones, and to verify this semi-annually. The longer the investment term the greater the tax benefit. For example, a 10 year investment term can eliminate a capital gains tax. Wide range of eligible investments including: new or existing businesses, property, equity (stock), partnership interest, equipment, infrastructure, etc. In June 2018 the U.S. Treasury Department evaluated and designated 8,761 low income census tracts in U.S. States and Territories as Opportunity Zones for a 10 year period, until 2026. The new Davis Opportunity Zone is one of 879 such zones designated in the State of California. The designation process included U.S. States and U.S. Territories evaluating eligible low income census tracts in their jurisdictions and submitting their nominations for Opportunity Zone designations to the U.S Treasury Department by March 2018. To be eligible for nomination census tracts had to have poverty rates of 20 percent or higher, or median family incomes below 80 percent of statewide or metro area median family incomes. Each State or U.S. Territory could nominate up to 25% of their eligible census tracts, and up to 5% of those nominated census tracts could be in areas that were contiguous with low-income community census tracts. Please visit the resources below for additional information. Of particular interest may be the California Opportunity Zone Marketplace website where you may review a listing of California Opportunity Zone properties/projects available for investment or market your own investment project.